This article is about the town in England. For the suburb in Western Australia, see Aveley, Western Australia. 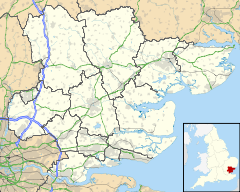 Aveley is a small town within the Thurrock unitary authority in Essex, England, and forms one of its traditional Church of England parishes. It is a suburb of London located 16.3 miles (26.2 km) east of Charing Cross in London and within the eastern bounds of the M25 motorway. Aveley is roughly bounded to the north and west by the London Borough of Havering, to the south by the A13 road and to the east by the M25 motorway. The nearest places are Purfleet, South Ockendon, Wennington and West Thurrock. Aveley has given its name to the Aveley Interglacial period around 200,000 years ago. Important evidence of the local flora and fauna of the period and some signs of occupation by Neanderthal humans have been found there. In Domesday the names has various spellings – Alvithelea, Alvileia and Alvilea. The name means Aelfgyth's wood clearing. A variation, in 1418, is Alvythele. After the Second World War the population grew rapidly as the area absorbed London overspill. Alice Diehl (née Mangold), the novelist and concert pianist, was born in Aveley. Kate Evelyn Luard, Royal Red Cross and bar was born in Aveley vicarage. John Newton, the author of Amazing Grace, lived in Aveley, which was the home of his father's second wife. The parish church of St Michael is a Grade 1 listed building dating from the 12th century. It contains a 14th-century memorial brass to Radulphus de Knevynton, which is echoed in the arms of the Thurrock unitary authority. The church was declared unsafe in the 19th century, with the recommendation that it should be pulled down. However, this was averted by its parishioners, who raised £1,000 to save it. The Old Ship public house at 58 High Street is on the Campaign for Real Ale's National Inventory of Historic Pub Interiors. According to Thurrock Council, the ward of Aveley and Uplands had a population of 8,381 people in 2001. Aveley is the home of two non-League football clubs; Aveley, which plays at Parkside, and Thurrock, which plays at Ship Lane. Belhus golf course is located in Aveley near the site of the former Belhus Mansion. Much of the remaining land from Belhus forms the Belhus Woods Country Park. ^ Nick Ashton: Early Humans, New Naturalist series (London: HarperCollins, 2017), pp. 168–70. ^ Lewis, Frank (1976). Essex and Suger. Philimore. p. 51. ^ a b c "Appendix 7 to Thurrock Development Plan" (PDF). Archived from the original (PDF) on 13 May 2012. ^ Brandwood, Geoff (2013). Britain's best real heritage pubs. St. Albans: CAMRA. p. 39. ISBN 9781852493042. Wikimedia Commons has media related to Aveley. This page was last edited on 4 December 2018, at 15:54 (UTC).